NASA Sees 'Bright Spots' On Dwarf Planet In Our Solar System : The Two-Way Scientists are puzzled by a new image taken by NASA's Dawn spacecraft, which found two bright spots on the dwarf planet Ceres. The spots are noticeably brighter than other parts of the surface. 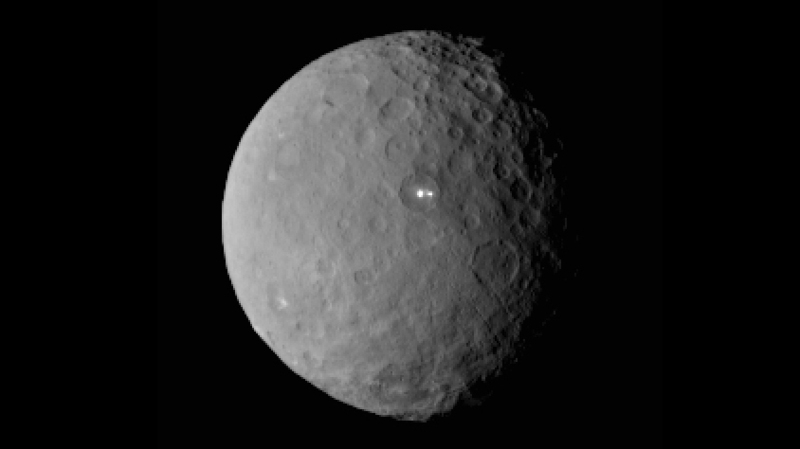 An image of Ceres taken by NASA's Dawn spacecraft shows that the brightest spot on the dwarf planet has a dimmer companion. Scientists are puzzled by a new image taken by NASA's Dawn spacecraft, which found two bright spots on the dwarf planet Ceres. The spots are noticeably brighter than other parts of the surface, which looks to be rocky and pockmarked. Ceres lies in an asteroid belt between the paths of Mars and Jupiter. A white area was previously seen in 2004, in an image taken by the Hubble Space Telescope. But new images show there are actually two spots, and scientists do not know what's causing them. "Ceres' bright spot can now be seen to have a companion of lesser brightness, but apparently in the same basin," says Chris Russell, principal investigator for the Dawn mission that's based at the University of California, Los Angeles. "This may be pointing to a volcanolike origin of the spots, but we will have to wait for better resolution before we can make such geologic interpretations." The image was taken on Feb. 19 from a distance of nearly 29,000 miles, NASA says. The Dawn craft will eventually enter into orbit around Ceres, promising even sharper images of the mysterious spots. "The brightest spot continues to be too small to resolve with our camera, but despite its size it is brighter than anything else on Ceres. This is truly unexpected and still a mystery to us," said lead investigator Andreas Nathues of the framing camera team at the Max Planck Institute for Solar System Research in Gottingen, Germany. Ceres is some 590 miles across, with a diameter that's wider at the equator than at the poles. Scientists have called it an "embryonic planet" whose development was stalled by the gravity of nearby Jupiter. "Ceres has more in common with Earth and Mars than its rocky neighbors. There are signs that Ceres contains large amounts of water ice beneath its surface. Scientists using the Herschel Space Observatory found evidence for water vapor on Ceres. The vapor may be produced by cryovolcanoes or by ice near the surface sublimating (transforming from solid to gas). This proves that Ceres has a icy surface and an atmosphere as well. Astronomers estimate that if Ceres were composed of 25 percent water, it may have more water than all the fresh water on Earth."